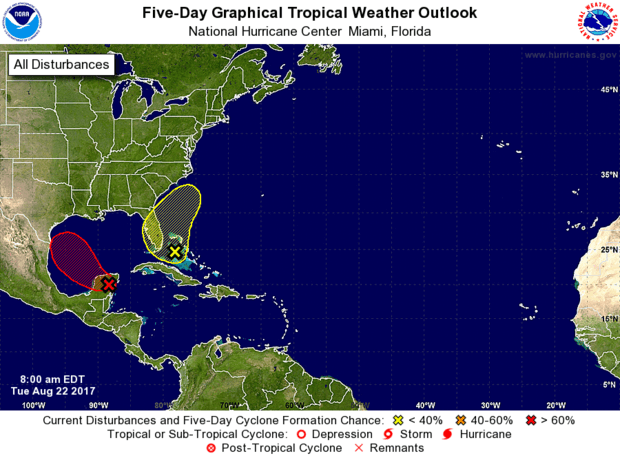 The remnants of Tropical Storm Harvey are expected to redevelop into a tropical depression over the Gulf of Mexico in the next day or two, hurricane forecasters said Tuesday (Aug. 22). The disturbance's path currently targets the Texas coast and northeast Mexico. As of 7 a.m. Tuesday, the National Hurricane Center said the storm was over the Yucatan Peninsula and was producing disorganized showers and thunderstorms. It's expected to move over the Bay of Campeche Tuesday night, where forecasters say environmental conditions are conducive to development. A tropical depression is expected to form over the southwestern Gulf of Mexico on Wednesday or Thursday, the National Hurricane Center said. It advised people along the Texas coast and in northeastern Mexico to monitor the progress of the storm, which has a high chance (70 percent) of becoming at least a depression within 48 hours and a 90 percent chance within five days. Regardless of development, forecasters said heavy rain and gusty winds are expected during the next day or so across Belize and the Yucatan. The National Hurricane Center also is tracking a broad trough of low pressure near the northwestern Bahamas. Storm activity associated with it Tuesday morning remained limited. It's expected to move northwest then turn northwest again near Florida. Environmental conditions could become more conducive for development as it moves over the western Atlantic, forecasters said. It has a low chance (10 percent) of developing into at least a tropical depression within 48 hours and a low chance (30 percent) of developing within five days.